When I was pregnant with my first baby, I began to research biracial hair care for babies. I didn’t know what her hair would look like, but I wanted to be prepared with the knowledge of how to take care of her mixed hair. Because of all the research I did, I knew that it could take some time for a mixed baby’s natural hair texture to come out. (My kids are mixed with African American, Ghanian, and Caucasian to help clarify what type of mixed hair I’m talking about). When both of my kids were born they had fine, straight hair that would curl a little bit when wet. This surprised a lot of people because they assumed they would have very curly hair at birth. But over time, their hair became coarser and much curlier. Although the hair care process while they’re infants may not be too different from a non-mixed baby’s hair care process, as their hair becomes curlier and has more texture, that will change. So how do you take care of your baby’s biracial hair? When is it time to change their hair care routine? 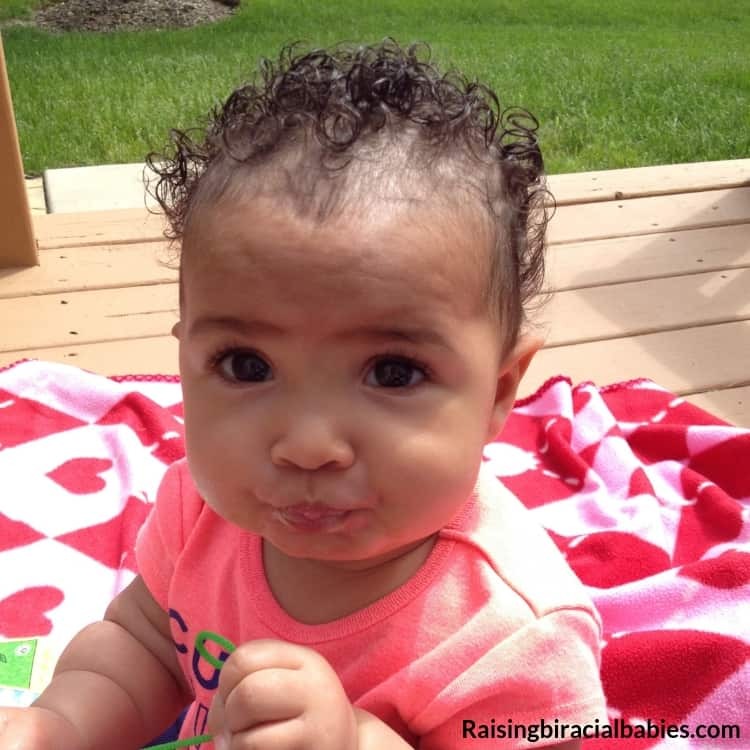 What biracial baby hair products are best to use for a mixed baby’s curly hair? Let’s dive in and answer those questions! Because my kids had fine hair, it didn’t need to be washed a lot. (Also babies don’t do a whole lot that they need to have their hair washed every day!) So I aimed for a couple times a week. (This routine of washing it a couple of times a week has never changed because as they got older, it became more necessary to keep their hair protected and moisturized). When they were babies, I used Mixed Chicks shampoo. This worked well when they were little because again, their hair was fine and there didn’t seem to be any moisture loss and I only used it once or twice a week. However, as their hair texture changed I stopped using shampoo because there was a noticeable difference in how dry and tangled their hair was after using it. Once my daughter was an older toddler I began this hair care routine for mixed curly hair. When conditioning their hair, I used this conditioner and used a wide tooth comb to comb out my kids hair. You can also finger comb the conditioner through the hair if their hair is fine. You know those generic baby brushes that come in every baby kit you get? (You know the ones that come with nail scissors, and other baby hygiene products and they look like they are for dolls?) Don’t use that to brush out your baby’s hair! In fact I don’t suggest using any brushes because they can ruin the curl pattern, cause frizz, and breakage. When rinsing the conditioner out, I made sure to rinse it all out. At this stage, they didn’t need extra conditioner kept in their hair because it would just leave their hair tacky or weighed down. After rinsing the conditioner out I would put some of the Mixed Chicks leave in conditioner in their hair. I started using the leave in conditioner when my kids were around 4 months old, (as this was when their hair started getting longer and the curl pattern was emerging more). You want to make sure you’re applying any product while their hair is still very wet, otherwise it can get frizzy, sticky, and the curls won’t be as defined. As the curl pattern started to develop in my kids hair, this leave in conditioner was great! However, as they got older it didn’t provide the same hold and definition as when they were babies. These are our favorite products for mixed curly hair right now! You want to avoid towel drying their hair especially as their curls begin to come in. Towels can cause the hair to frizz so the best way is to let their hair air dry. This usually doesn’t take too long because baby hair tends to be short. However if your baby has long hair, you can use an old t-shirt and blot their hair dry. Again, avoid rubbing their hair to dry it because it will just frizz the hair. You can read more tips on biracial hair care for toddlers here. One of the pesky things that can happen to any baby is cradle cap! Both of my kids had a mild case of it at some point and it’s like thick, scales that come off of your kid’s scalp. Lots of people mistakenly think cradle cap is caused because the scalp is dirty and it can go away by washing their baby’s hair more often. This isn’t true and can cause more harm than good, (depending on what is causing your child’s cradle cap and also because your child will lose necessary moisture in their hair). If you’re interested in reading more about cradle cap, this article explains it. Since you don’t want to wash your biracial babies hair too often, (to avoid losing moisture) how can you get rid of those pesky scales?? Well you can try applying an oil to the scalp, letting it sit, and gently combing the scales off. You can try using a nail brush and brushing the scales off before you wash their hair, or during the bath. (For other dandruff remedies and lots of other useful information about biracial hair, pick up a copy of my book, The Ultimate Guide To Biracial Hair Care)! When I wanted to refresh my kid’s curls the next day, it was relatively easy. All you have to do is thoroughly wet their hair, (you can do this with a spray bottle) and finger comb some of the leave in conditioner into their hair. The amount of leave in conditioner you need to use will vary depending on your child’s hair, but I would say start with less and add more if you need to. If you use too much their hair can get goopy, sticky, and their curls will be limp. When you’re styling their hair, use your fingers to evenly distribute the product throughout their hair in a way that encourages their hair to curl. This may look like scrunching their hair from the bottom towards the scalp if it’s long enough, or using your fingers to follow the curl pattern as you distribute the product. You also don’t want to touch their hair too much after you’ve applied the product because it will become frizzy. How will you know when it’s time to change your child’s hair routine? One way to know is when your child begins to get more texture in their hair. As it becomes coarser, it needs a lot more moisture so at the very least you will want to change up some of the products you use. Another way to know is if the products you’ve been using aren’t giving you the same results, it’s probably time to try something different. These tips will help erase any confusion you may have about how to take care of your biracial baby’s hair. The key to mixed baby hair care is keeping it moisturized, encouraging the curl pattern, and setting the foundation for lifelong habits that will give your child healthy, beautiful hair!